With an absolute dreadful season of PAC-10 basketball upon the West Coast, I'd like to thank the Portland Pilots for rising up at just the right time. Oregon, UCLA, USC, Cal, Arizona are all in for long seasons. Only Washington seems worthy enough to carry the PAC-10 flag into the NCAA tournament in March. If you like train wrecks and cheese steaks dripping with gooey cheese whiz ... then MTV's new show 'Jersey Shore' is something you can't miss. It's a simple formula: 20-something adults that value their appearance over everything ... combined with ... Jersey shore night clubs ... all mixed together in a vat of alcohol. Let the good times roll! Women are goin out to the movies in force?!?!?!? Apparently, Twilight Saga: New Moon has raked in a total $72.7 million on day one of it's release (friday). One day! That is a whole lot of chicks goin out on their own ... or together ... or draggin some hopeless boyfriend along ... to see this vampire-romance sequel in the theaters. All I gotta say is ... FINALLY!!! The Ducks strut out of Tucson with a huge win. Somehow, Masoli escapes with the 'W'. 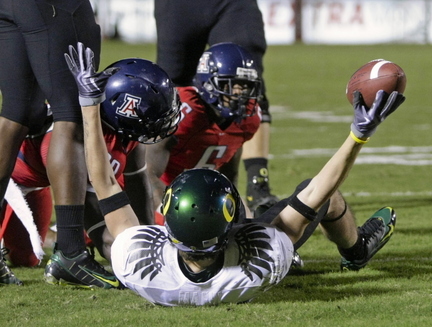 Jeremiah's fumbles and interception put the game in serious doubt for Oregon. But the defense kept its head up in the 2nd half and LaMichael James kept scrapping for extra yards. Enough for Masoli to redeem himself and make some key plays to get the tremendous 'W' on the road in an unfriendly Arizona Stadium. I give thee ... The Clash of the Titans ... RE-BOOT!!! I watched the original about 256 times on HBO during my teenage 80s. It was cheesy-good action fun. And it was Harry Hamlin's one big shot at being an action star. Didn't quite work out for Harry. But I'm certainly tempted to rent it before the re-boot hits theaters in March.